greetings, I have never been so eager to make a new pair of sandals as I have these: These are “stitch-downs”! Doesn’t it seem that the edges are turned out, then stitched to the sole?! To make the ankle strap, which seems to be about 1/2″ wide, cut a strip of leather 1 3/16″ wide. Cut another piece of leather to act as the “core” of the ankle strap slightly less than !/2″, about 3/8″ wide. Draw a line down the center of one side with a pen. Apply contact cement (Titan DX recommended) to the inside of the strap leather and the core leather. When the cement has dried, adhere the strap leather along the pen line, rotate the strap so you now adhere the strap leather to the outside of the core leather, then finish by turning the strap again and adhering the remaining strap leather. It might be best to make a little sample of the actual leathers you are using, to make sure that the last piece butts up against the pen line. Press firmly, and your strap is completed. As far as how to anchor the straps, please see my sandalmaking video. In Hindu philosophy, isIn Hindu philosophy, ishvara is the Sanskrit word for soul. “There must be soul in what you do,” says Jose Marco, the designer of the sandal brand that bears the name. “Whatever it may be — cooking, caring for a plant, choosing a beautiful piece of leather to make sandals — soul is needed.” Having designed and sold Ishvara’s classic tanned-leather Mediterranean sandals from a tiny beach storefront in Formentera, Spain (the brand is based in Ibiza), since 1982, Marco is finally bringing his casual, colorful flats to the states. 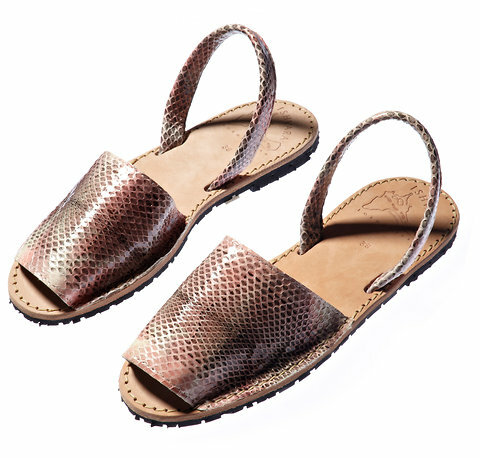 These python albarcas, modeled after ones commonly worn by fishermen in the Balearic Islands, are a standout. Sole (or should I say soul) searching has never been easier.